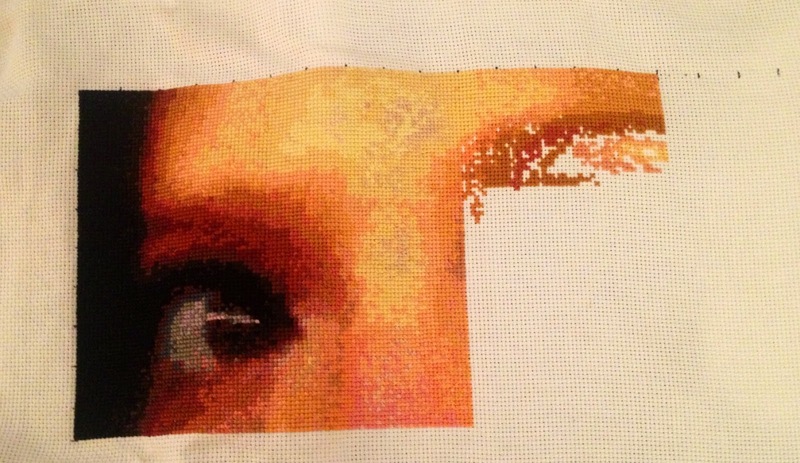 WIP: Spanish Eyes, Oct. 15,2014. 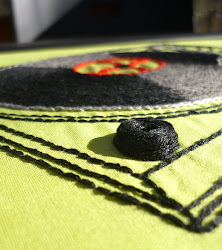 And here is a money shot! Moving at the speed of sloth. 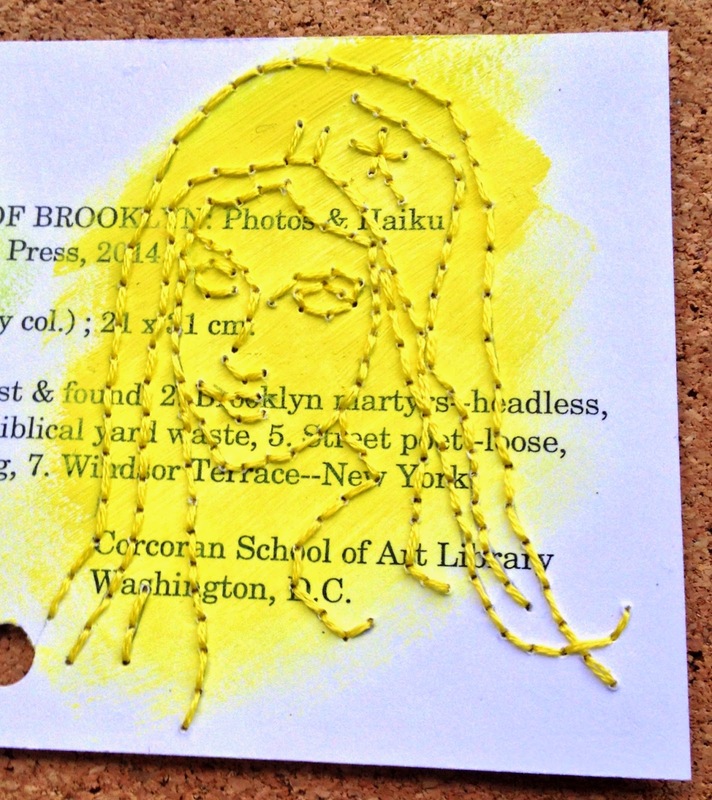 I wasn't happy with the first version of the Street Virgins of Brooklyn make believe library catalog card, so I made a second version. 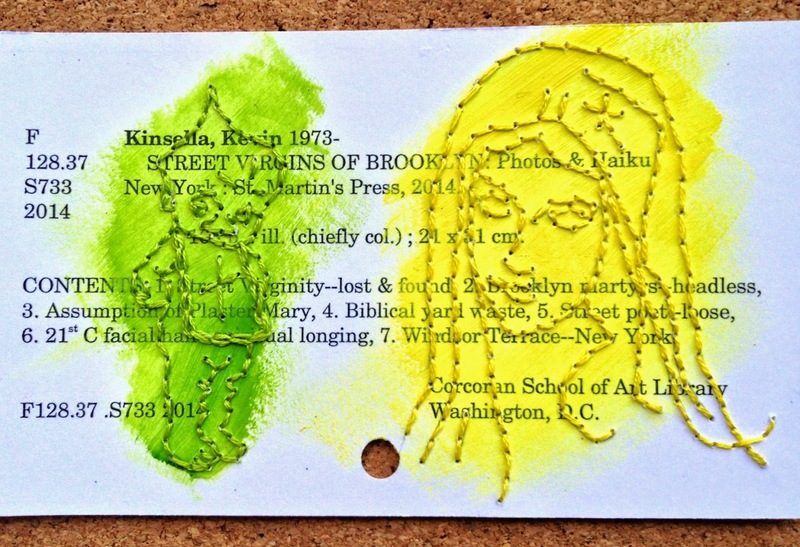 Street Virgins of Brooklyn 2, faux library catalog card. 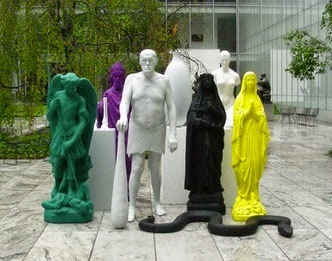 I'd wanted to capture more of the feel of German artist Katharina Fritsch's sculptures, particularly the collection of figures in the MOMA sculpture from a few years back. 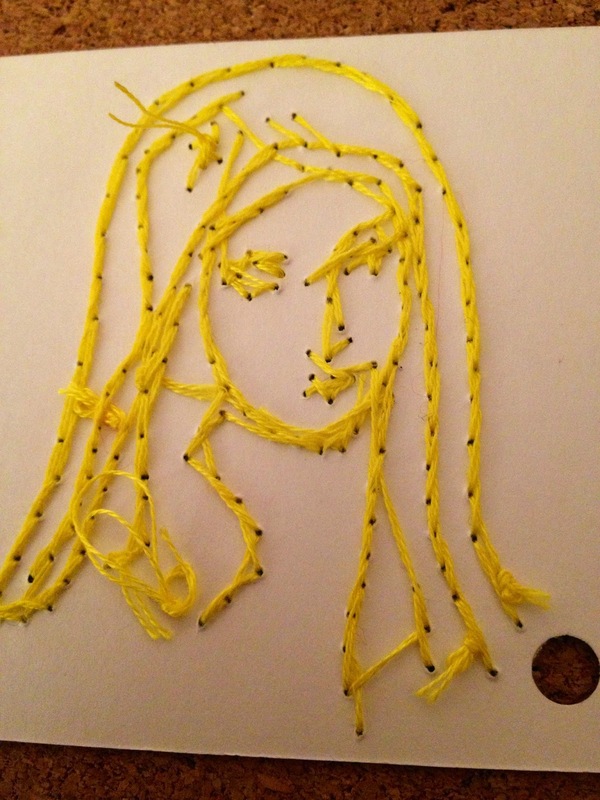 My first attempt was too muddy and soupy, not enough pop of color or unnerving crispness. To recap the content of this make believe book... Street Virgins of Brooklyn it is the work of Brooklyn poet and Russian translator Kevin Kinsella. In the volume, Kinsella roams the streets of his Windsor Place neighborhood, communing with the biblical yard statuary he finds in alleys and tiny front gardens. 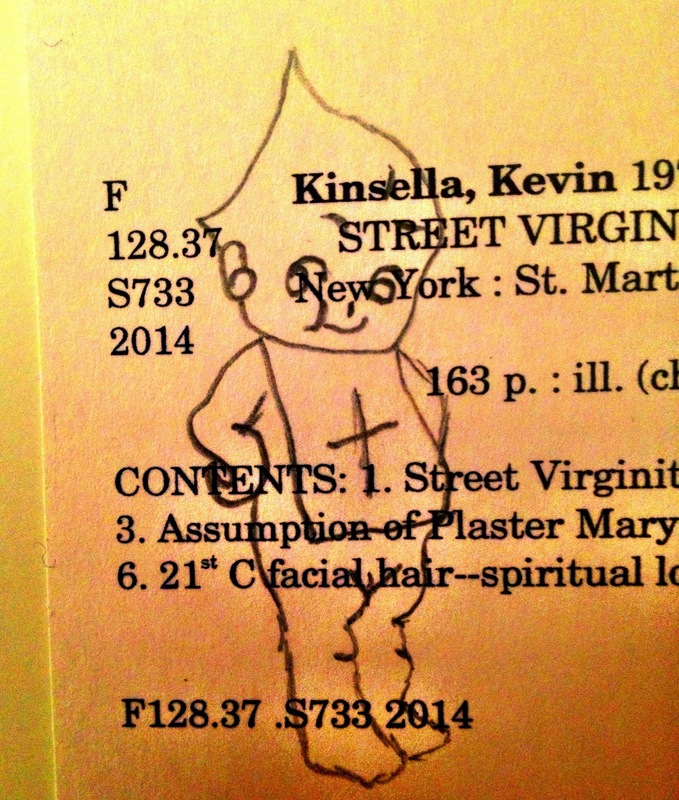 Kinsella's hauting haikus are responsible for the rediscovery of a forgotten NYC figure, Saint Kewpie, who was horrifically martyred in a Queens apartment incinerator and canonized during the brief papacy of John Paul I. 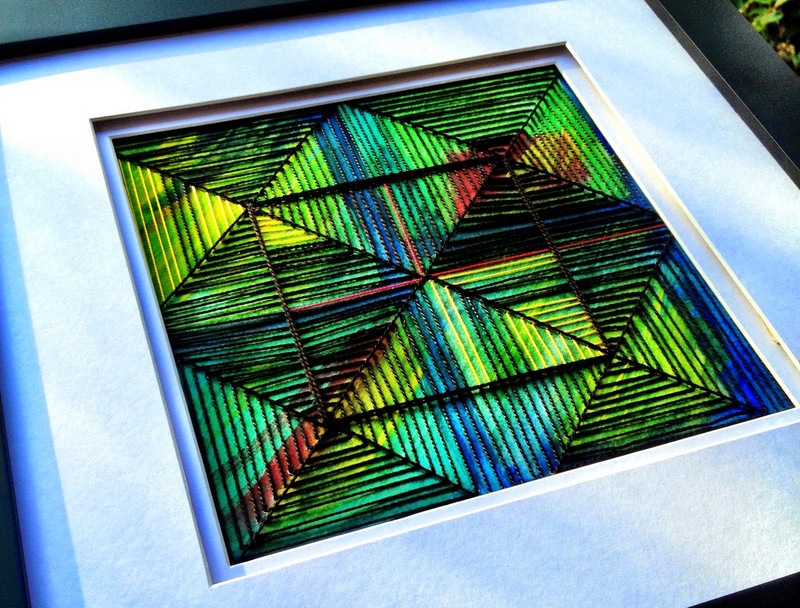 Process piece. 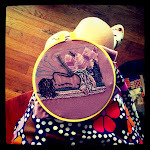 Yellow Madonna from the back. As the reworking of this card has taught me, a Kinsella's work is never done. 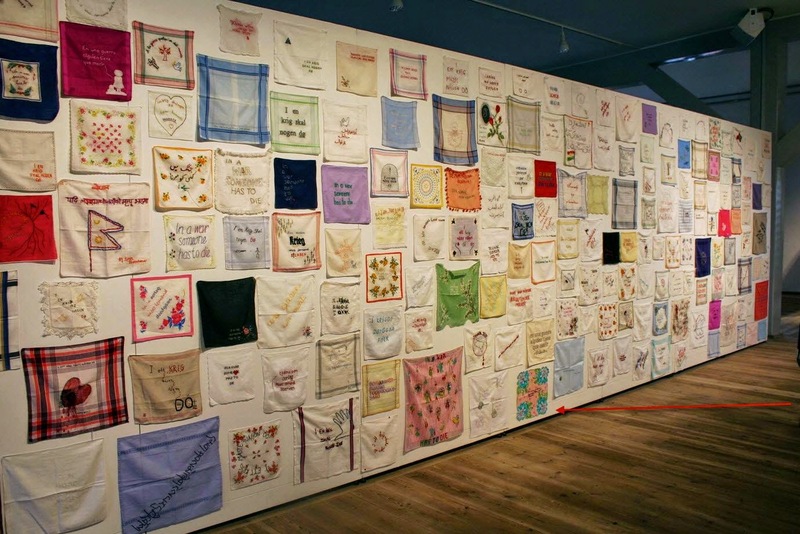 Back in 2012, I contributed to a collaborative, stitched art project call In a War Someone Has to Die, created by Danish artist Hanne Bang. 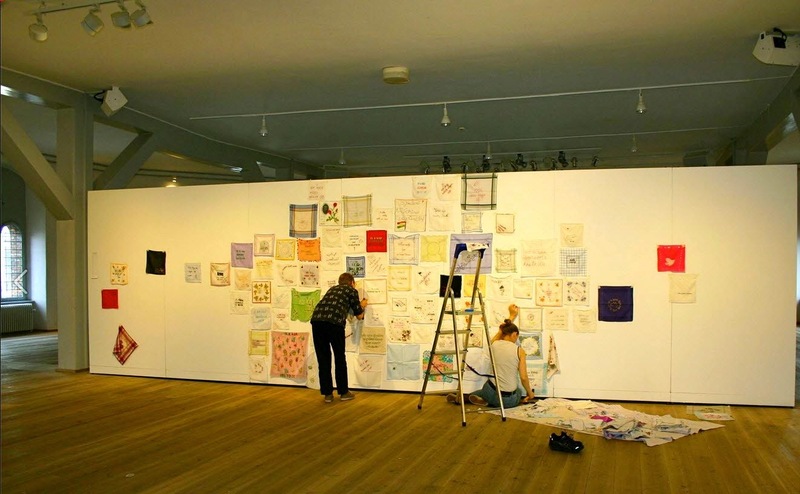 The collection has been exhibited several times, most recently as part of the miniTex14 exhibition at the Rundetaarn in Copenhagen. I was excited to find my pink, scalloped handkerchief on the wall, embroidered with my mother's beautiful handwriting, in Spanish, her first language. 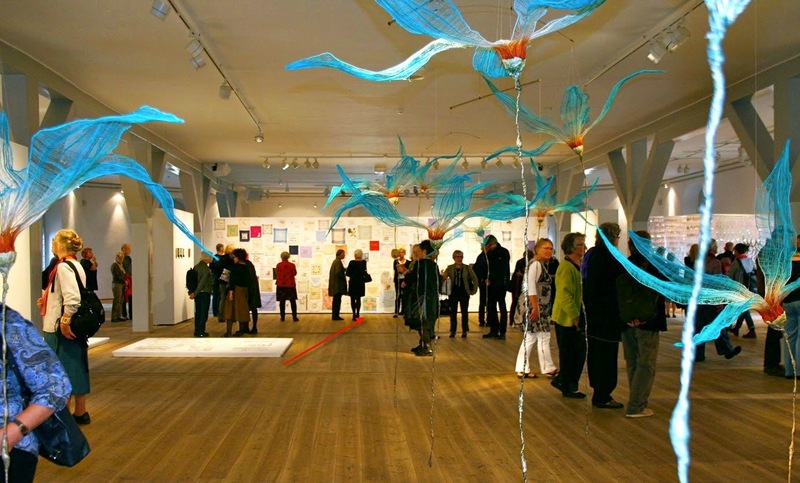 I want to go to Denmark to see the whole exhibition! In the meantime, here is a video about it, with lots of wonderful images. 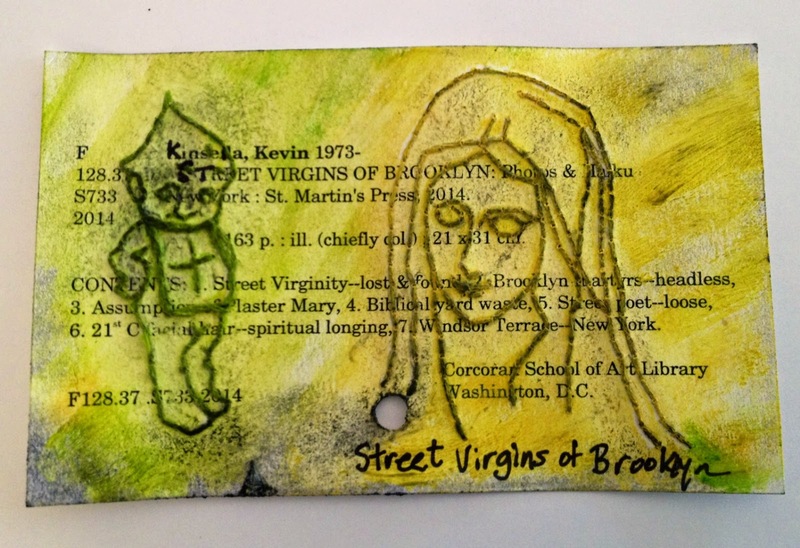 Street Virgins of Brooklyn is a collection of photos and haiku by poet and Russian translator Kevin Kinsella. Kinsella wanders the streets of Windsor Terrace, his Brooklyn neighbor, writing poetry and communing with the biblical garage statues he encounters. 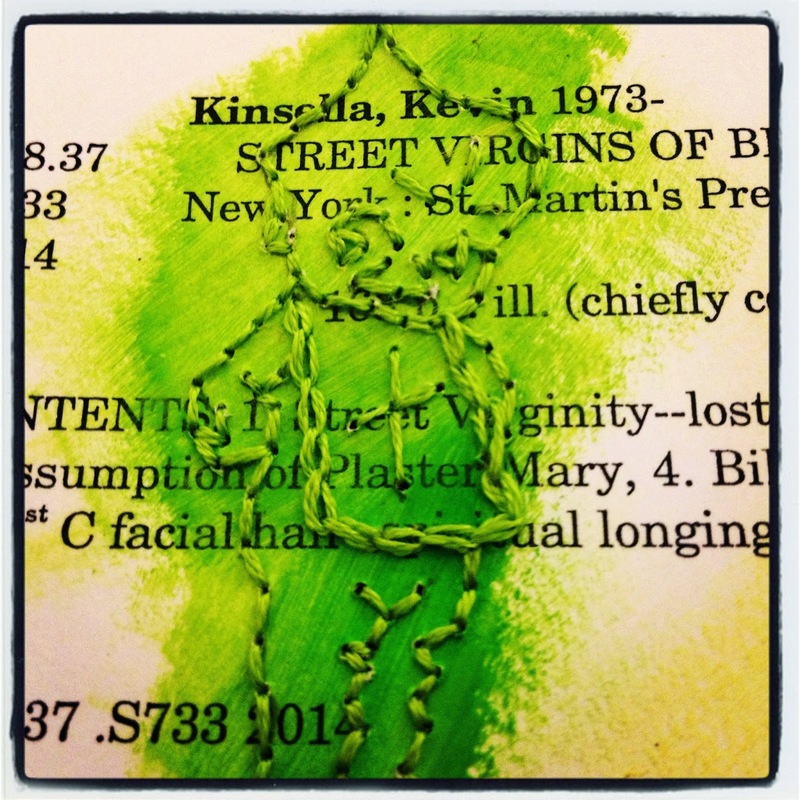 Mold is spreading on the card catalog entry for the make believe book. Even though the Street Virgins was just released this year, physical copies of the book are mysteriously (some would say miraculously) decomposing at a rapid pace. It's as if the books, presumably safe on the coffee tables and bookshelves of their Brooklyn homes, are suffering the same elemental decay of the plaster yard saints they depict. Pages are buckling and curling. Mold is growing on the spines. A chorus of WTFs rises in Brooklyn. 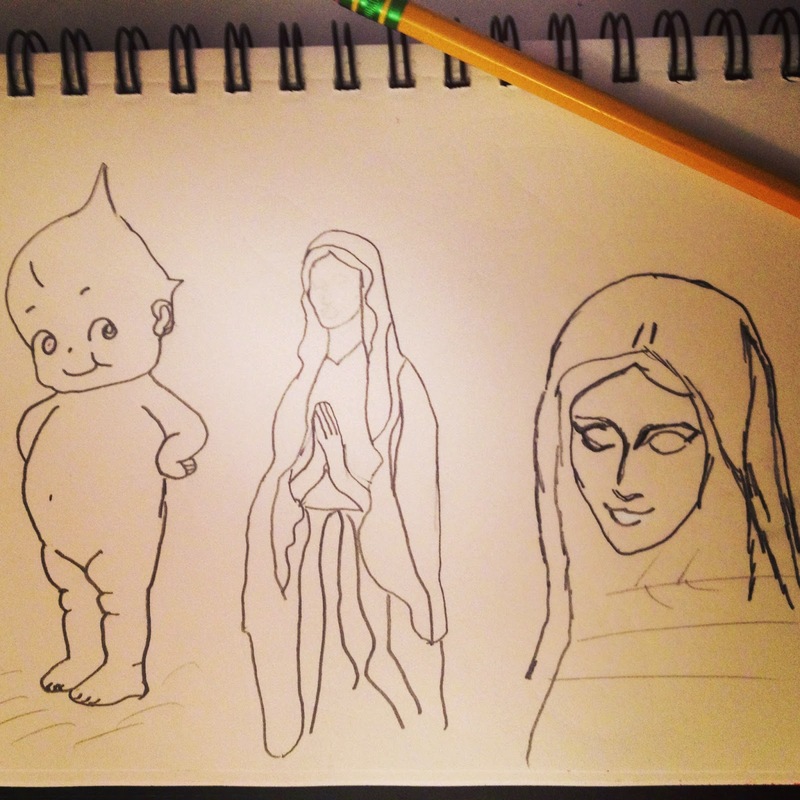 WIP: Saint Kewpie, who was canonized by Pope John Paul I. The Vatican was not available for comment. Biblical yard waste sketches, based on photos by Kinsella. The most terrifying and yet somehow predictable morning in the Kinsella household occurred a week ago. 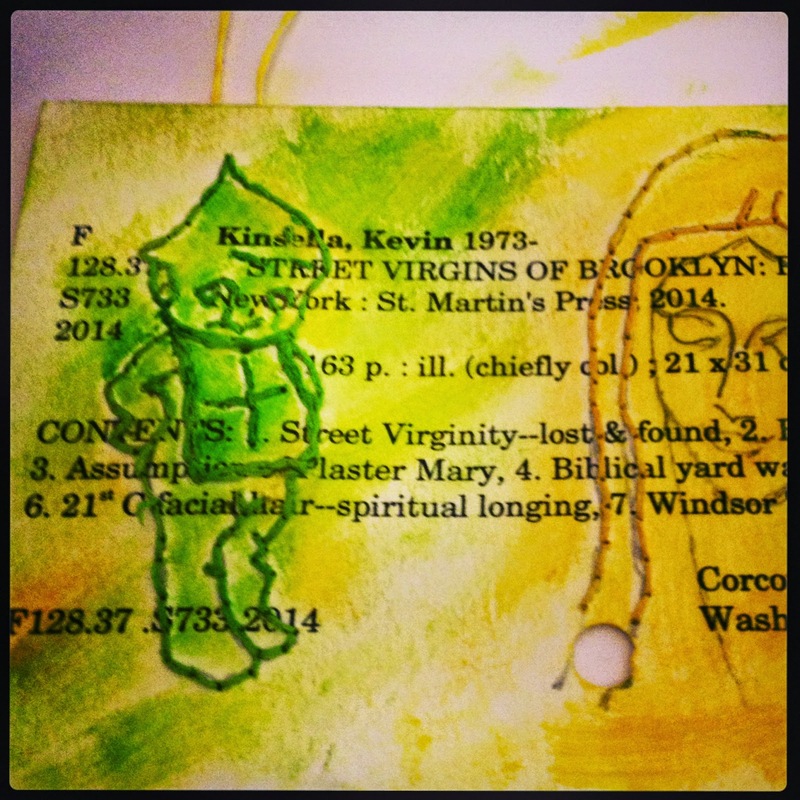 Kinsella returned home from walking his daughter to pre school to find a small army of neighborhood Saint Kewpies (who was martyred in a Queens incinerator back in the 1970s and canonized during the 33-day papacy of Pope John Paul I) staring menacingly down on him from his front steps. 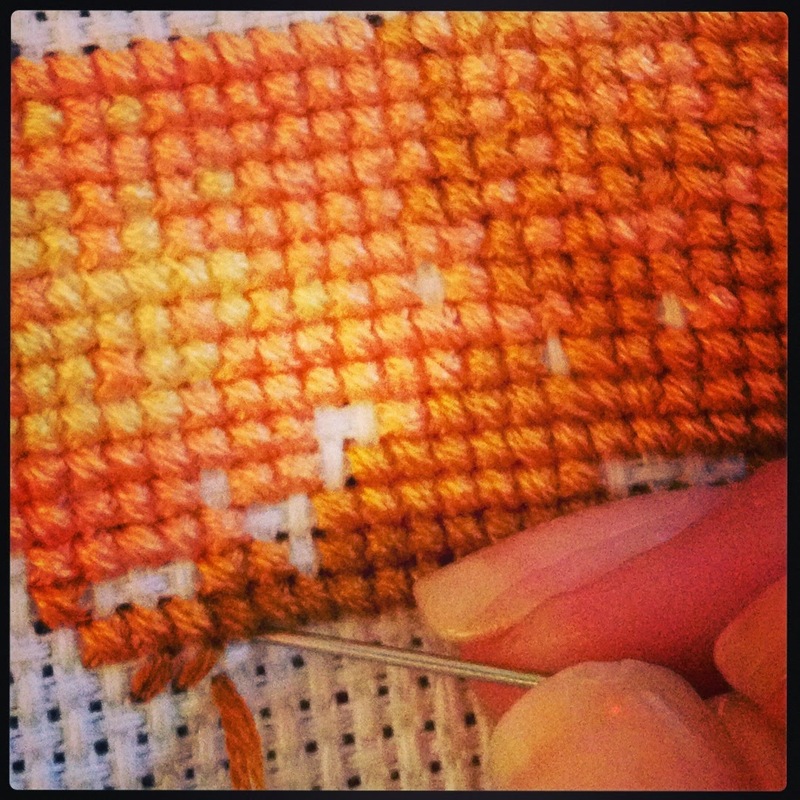 WIP: Fighting through the decay. This library catalog card is also decaying at a faster pace than one would expect.